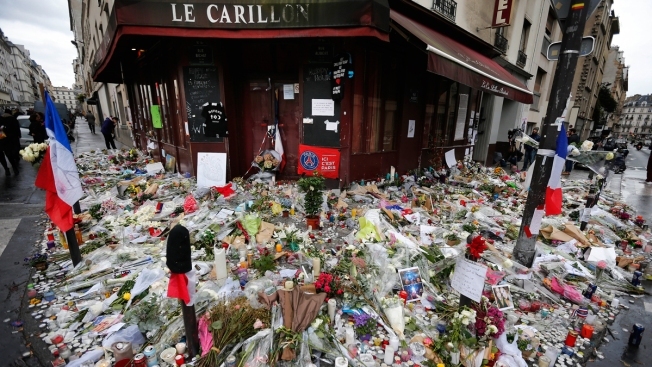 Flowers and candle tributes are placed at the Restaurant Le Carillon in Paris, Thursday, Nov. 19, 2015, after last Friday's attacks. The Belgian jihadi suspected of masterminding deadly attacks in Paris died during a police raid on a suburban apartment building, the city prosecutor's office announced Thursday, with France still reeling from the Friday attacks that killed 129 people and wounded hundreds of others. A University of Rhode Island professor has developed a sensor that detects the kind of explosive used in the Paris bombings, to try to stop future attacks. Professor Otto Gregory compares his sensor to a dog's nose, the "gold standard" in explosives detection. It "sniffs" the air for vapors emitted from explosives. Gregory is evaluating how well his sensor detects triacetone triperoxide. The Paris attackers packed TATP into their suicide vests and wielded assault rifles, killing 130 people in November. The U.S. Department of Homeland Security began funding Gregory's work through an explosives research center in 2008. His sensor is designed to continuously monitor an area. It doesn't need training or breaks, as bomb-sniffing dogs do. Gregory plans to test it at an FAA facility, then on cargo containers at a port.